(PhysOrg.com) -- Researchers at the Nottingham Trent University have gathered new evidence that a 4000-year-old monolith was aligned to be an astronomical marker. The 2.2 metre high monument, located in the Peak District National Park, has a striking, right-angled triangular shape that slants up towards geographic south. The orientation and inclination of the slope is aligned to the altitude of the Sun at mid-summer. The researchers believe that the monolith was set in place to give symbolic meaning to the location through the changing seasonal illuminations. Dr. Daniel Brown will present the findings on Tuesday 27th March at the National Astronomy Meeting in Manchester. 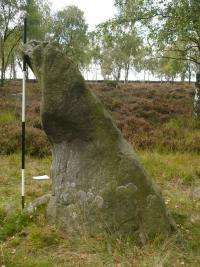 The rare example of a monolith is located at Gardoms Edge, a striking millstone grit ridge less than an hours drive from Manchester. The researchers have carried out a microtopography survey of the surface surrounding the monolith. Their findings indicate the presence of packing stones around the base of the monolith, evidence that it was placed carefully in position. They have also carried out 3-D modelling of illumination of the stone through the seasons, adapting for changes in the Earths tilt to the ecliptic plane over four millennia. The landscape surrounding the stone harbours many ancient monuments such as Bronze Age roundhouses, a late Neolithic enclosure, and other traces of a long lasting human occupation. The researchers believe that the stone is also late Neolithic, set in place around 2000 BC. "Given the sensitivity of the site, we can't probe under the surface of the soil. However, through our survey, we have found a higher density of packing stones on one side, supporting the case that the stone has been orientated intentionally," said Dr. Brown. The 3-D modelling shows that during the winter half-year, the slanted side of the stone would remain in permanent shadow; during most of the summer half-year it would only be illuminated during the morning and afternoon; close to midsummer it would be illuminated all day. The researchers are currently backing up the modelling work by gathering contemporary photographic evidence of the stone. "The stone would have been an ideal marker for a social arena for seasonal gatherings," said Dr. Brown. "It's not a sundial in the sense that people would have used it to determine an exact time. We think that it was set in position to give a symbolic meaning to its location, a bit like the way that some religious buildings are aligned in a specific direction for symbolic reasons." The researchers hope that the new evidence will support the case for a wider archaeological survey of the site. "The use of shadow casting in monuments of this period is quite rare in the British Isles," said Dr. Brown. "But there are some examples including New Grange, Ireland, and some Clava cairns in the north-east of Scotland that have been proposed to include the intentional use of shadows. Both are associated to burial sites using the symbolism of a cyclic light and shadow display to represent eternity. Given the proximity of the Neolithic enclosure and possible ritual importance of this site, the Gardom's Edge monolith could be another such example."